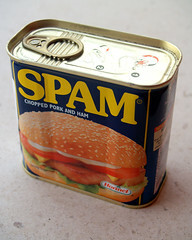 Search Engine Guide > Mike Moran > How do you know what is search spam? Last week, I asked the musical question, "Is Your SEO Strategy to Barely Avoid Spamming?" One of the commenters told me that he waited and waited in that article to find out what the line was between spamming and ethical behavior, but I didn't tell him. So, that's what we tackle this week. All the usual suspects are there, ranging from tricking the search engine by showing the search engines a different page from what the searchers see, all the way to creating fake links or buying links to fool the engines into thinking your page is better than it is. You'll hear all sorts of different names for these tricks: hidden text, link farms, paid links, cloaking—there are even more sophisticated techniques. Negative SEO is a way for your competitor to set up a link farm pointing to your site so that Google punishes you, thinking you did it. I know people setting up fake social media profiles so that they can fool Google into thinking many people are talking about their content. I believe that is a mistake. Even if you think you know exactly where the line is, it is in the end a judgment call by each search engine. And it is dumb luck whether you are caught or not. And honestly, no one but the search engines really know where the lines are. I think we can all do better. Next time, ask yourself if what you are doing is good for all three parties in the search transaction. Is this tactic good for you (the search marketer), good for searchers, and good for the search engine, too? If it is, keep it up. Whatever you are doing is not only not spam, but it is something good for everyone involved, so it will eventually be rewarded—perhaps immediately. But any time you are doing something that does not work for everyone, it will eventually be branded spam or it will be made ineffective, or both. A few years ago, all the smart SEOs were talking about "PageRank sculpting," a technique that helped you control the level of quality that each page on your site has in the eyes of Google. All you needed to do was to carefully control which pages linked to which other pages on your site and voila!--you improve the search rankings of the pages you want. And it worked--for a while. But who was that technique helping? It was helping the search marketer, but not really helping Google or the searcher, so eventually search engines stopped calculating their ranking algorithms the same way and the technique stopped working. Today, many smart SEOs tell you that you must buy links to get the rankings you need. I know a few companies that do little else but sell links on content networks that are undetectable by search engines.You might or might not think that buying links is unethical, but it is clearly bad for the search engines, because the "wrong" pages (not the ones searchers might want) are ranked higher. So, the search engines are fighting back. Many SEOs ask me, "How will they stop it? No one can see the money change hands." My answer is that I don't know for sure how they will stop it. I am sure that the search engines use algorithms to sniff out the dicey links and give them less weight. But the search engines have a secret weapon. They control their ranking algorithms. If it ever gets to the point that the search results are being too heavily affected by paid links, the search engines can stop valuing links completely (or as heavily). They can rank the pages based on page views, social media activity, or just about anything else that strikes their fancy. They can rank based on all these factors so that when all the factors don't agree, the search engines downgrade—then you'll have to fake links and fake social media activity and fake page views for it all to work (or even more stuff). The search engines haven't done that (yet) because links still work well enough. But if enough people start buying links, then the search engines will find a way to regain the balance in the marketplace, because their very business depends on it. So, the short answer is to stick to things that help everybody. Better content that contains the right keywords helps searchers understand things better. Be helpful or entertaining, because then you'll attract links, activity, and every other visible indicator of attention—that marks your site as being of high quality. Everybody wins. But if it feels clever and tricky and like something that you don't want your competitors or customers to know you are doing, stop. If it isn't against the search engines' rules, it soon will be. If it is working now, it soon won't be. My approach (and what I advise clients on) is similar to yours - following a straight line, producing a quality product and generating business organically. So what are your thoughts on the frustration that many webmasters must experience when they see other websites deploy these spam or "near spam" tactics and trump their own white hat website rankings? Hoping that Google eventually catches up is a noble approach - but if you are talking about revenue or income - or let's say put food on the table, it can motivate people to try tactics that Google may not appreciate. I never thought of the dangers of a competitor creating a link farm against you! Interesting post though thanks, I'm not a big fan of having links galore on a website to try and push SEO, maybe a few links from big sites that I'm friends of and links to other sites that I have done and relate to on a resources page. I find getting the rest of any organic SEO right tends to be enough to satisfy my clients in the results they receive. People that actually buy links may be seeing results now, but in the long run they will lose out, it wont take Google long to detect and kick out all of these. Thanks, Damian. I have never been big on orchestrated link building, either--I'd rather create great content and let the links fall where they may. Hi Duncan. I agree with you that it is frustrating to follow the right path and watch others race past you by cutting corners. But my advice is to pay no attention to them. In search marketing, as in life, they tend to drive off the road all by themselves, with no assistance needed from you.